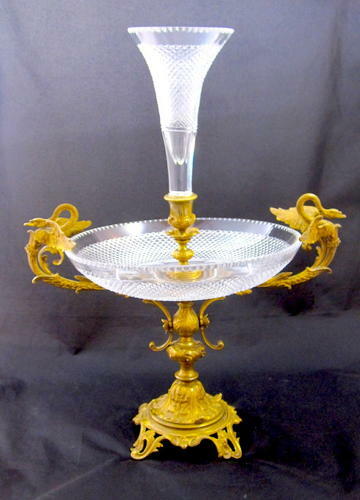 Antique BACCARAT Cut Crystal and Gilded Bronze Centrepiece. The Central Bowl and Tall Flute are Decorated with Diamond Cut Pattern. On the Sides of the Centrepiece, Two Fluted Dore Bronze Handles are Adorned with Classical Swans. The Top of Each Handle Attaches to the Rim and the Bottom Attaches to the Body of the Bowl and Dore Bronze Base. The Cut Crystal Bowl Rests a Dore Bronze Base Decorated with Scroll Work and Supported by Four Feet. High Quality Cut Crystal and Dore Bronze.